Townhome, 3 Bedrooms , 2.5 Baths, (Sleeps 10), walk to slopes! Our condo, at Village at Camelback, is fully-furnished, in a gated community with private security. It is a three-story townhome located just yards from the mountain, on highly sought after parking lot level. Parking is available for two cars, additional parking is also available, with easy, on-site check-in for permits. Our lower level boasts two bedrooms, one with a queen sized bed, the other with two bunk beds and one twin bed and a mini air-hockey table, and a full bathroom. 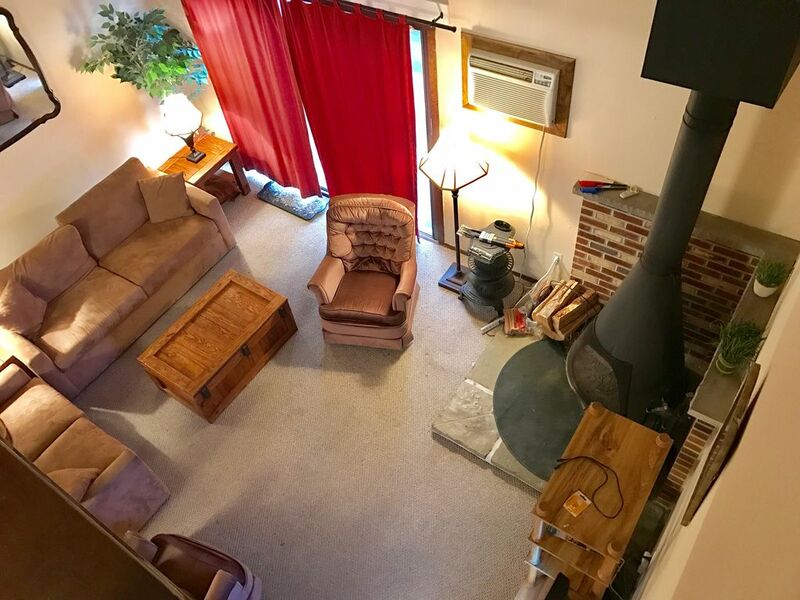 Main level includes a half-bath, fully equipped kitchen with table, living room with pull-out queen sofabed, foosball table, and wood burning stove. Upstairs you will find the loft, with queen sized bed and private full bathroom. Lots of closet space in all rooms! One of the few units that can sleep 10 comfortably and has an air conditioner! AQUATOPIA! Indoor waterpark right on the mountain! Kalahari is 10-15 minutes away! Camelback has 33 ski and snowboarding trails and a snowboarding park. Camelbeach is the largest waterpark in Northeastern Pennsylvania! It has a lazy river, wave pool,tube rides, over 20 slides, an Olympic-sized pool, mini-golf, scenic chairlift rides and more! Our unit is NON SMOKING and NO PETS are permitted -- We want the cleanest, healthiest possible environment for all of our guests to enjoy! Enjoy the indoor pool and hot tub, workout room, indoor and outdoor tennis courts, and basketball courts! Other activities include outlet shopping at the Crossings, horseback riding, hiking trails, Mount Airy Lodge and Casino, fishing, golf, antiquing, and more -- all within a few miles of our condo! Sought after Parking lot level condo, two parking spaces. Extra cars can be parked in overflow lot. Keurig. And standard coffee pot as well. Our unit is on parking lot level- no lugging ski/snowboards up and down steps! It's kid friendly featuring a foosball table, mini air-hockey table, and videos to play on our VCRs or DVD player. All rooms have comforters and pillows, and linens are available if needed- just let us know. Enjoy cooking out on the grill! I just got back from a 4 night stay over the New Years weekend. The house was very comfortable and spacious. The children loved using the amenities such as the indoor pool and the basketball court. The location is very close to great attractions such as Camelback mountain and Aquatopia. Jamie was very easy to get in touch with if we needed to ask a quick question.We all had a great time and would love to use this property again. The property is located in one of the best spots of Pocono mountains near all the attractions. The house was very clean and had everything we needed. Jamie was very easy to deal with and responded to any questions I had promptly. I highly recommend!!!!! Great place to send the weekend! Very pleasant stay at this villages townhouse. Close to camelback ski mountain. Very easy gate access. Kids loved swimming in the pool after skiing. Overall the condo was exactly as advertised. Very clean and spacious with plenty of room for everyone to comfortably stay. Jaime was incredibly friendly and helpful and made the entire process very easy and straight forward. Highly recommend for anyone looking for a great getaway spot. We are so glad you enjoyed staying at our condo! You were wonderful guests, hope to see you again! This condo was awesome! Not only was it spacious and well maintained but it had plenty of room for our family of 10, 5 of which were kids ages 1.5-11. The foosball table was our go to entertainment besides the DVDs and board games. Jamie our contact for this rental was very accommodating to the needs of our family and was very easy to work with. Having access to the club house pool was another great perk and activity for the family for our winter get away. Considering renting again for the summer as Camelback is so close and the water park looks awesome! We pay the association fee for you! Enjoy the indoor pool, sauna, indoor and outdoor tennis courts, and small gym at the clubhouse!